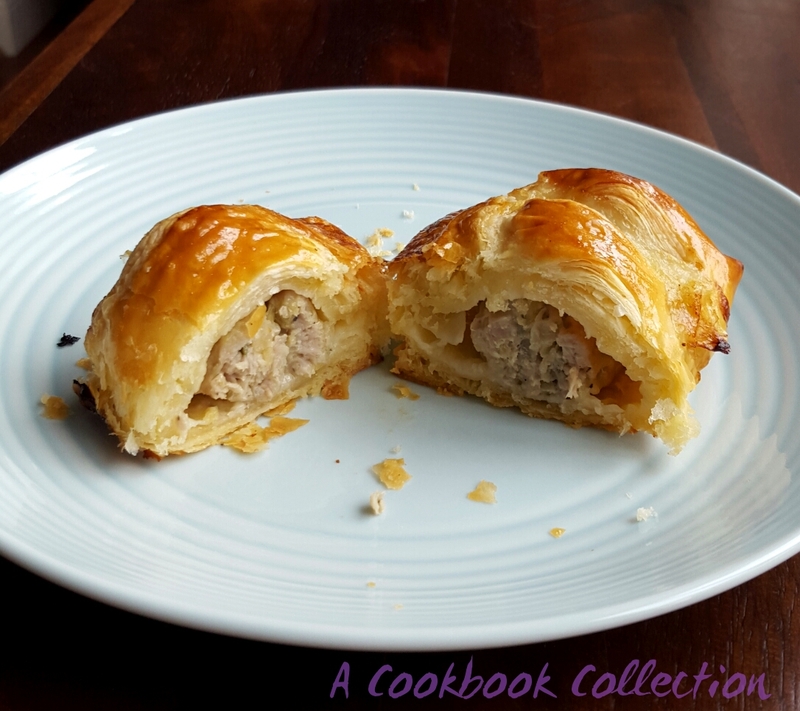 The humble sausage roll. It’s never going to rank at the top of gourmet delights but sometimes you just need the comfort a simple treat like this delivers. I have seen too many rolls that have lurid pink filling and I just dread to think what is actually in them. So much so that I was put off them for a long time. Until I started making my own. It’s impossible to describe how much better these taste if they are homemade. To make the filling you can buy sausage meat but if you do, it must be from a good butcher and try to get it freshly made. I usually buy a nice packet of gourmet sausages and cut the meat from the casing. This way you might get a nice bit of extra flavouring like leek or fennel in them. Try to buy sausages that have at least 80% pork in them, you’d be surprised with some how little actual meat is in them. I have used shop bought puff pastry here, if you do the same make sure it is the good stuff! If you want to make your own, Delia has a recipe here for quick flaky pastry that looks good, but not as time consuming as puff pastry. 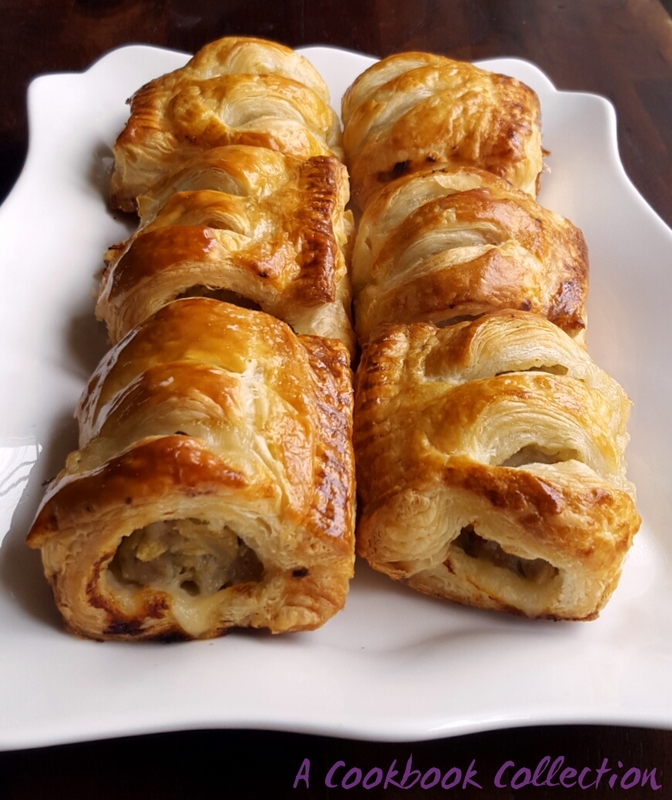 These rolls do not keep very well so if you are not eating them on the day you make them, freeze the cooked rolls and allow them to defrost at room temperature before heating through in a hot oven. You can also freeze them raw but I prefer to bake them first. Make narrower, smaller rolls for canapes for parties or to eat cold on a picnic when Summer eventually rolls round again! Preheat your oven to 220c/200c fan/gas mark 7 and line 2 baking trays with parchment paper. Fry the onions in the oil over a medium heat until they are soft, approx 10 minutes. When cooked, drain on some kitchen paper. Remove the sausage meat from their casings and put them into a bowl with the sage and season well with salt and pepper. Add the fried onions and mix well. Next peel and grate the apple and put it into some kitchen paper. Squeeze out any excess water from the apples so that the mixture will not become soggy. Add them to the sausage meat and mix well. 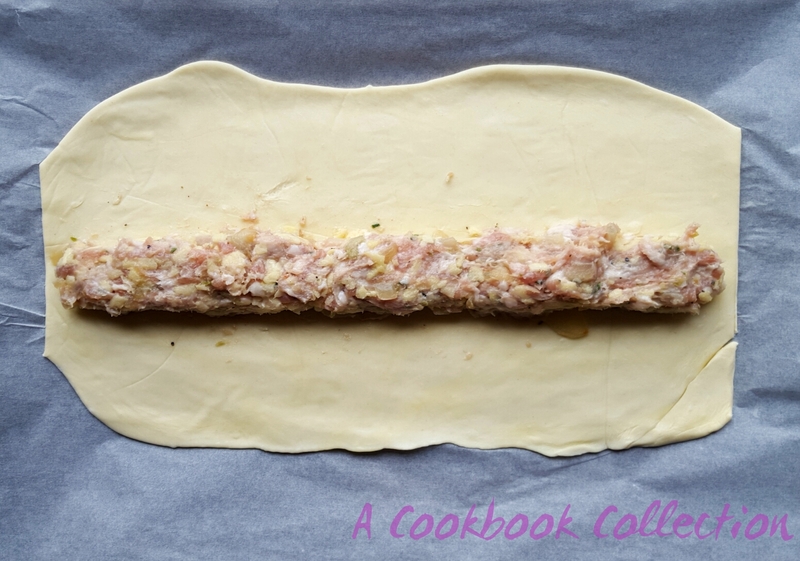 Halve the block of pastry and roll it out to a long rectangular about 5mm thick. I always roll mine between 2 sheets of parchment paper as it is much less messy. 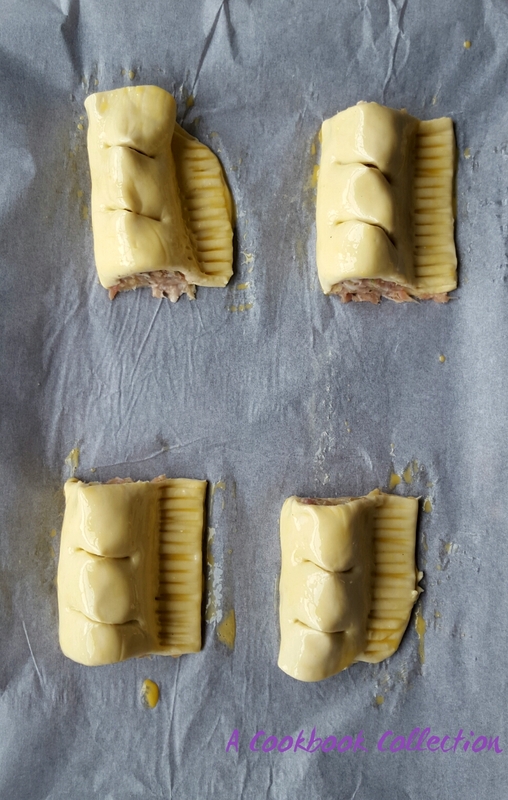 Halve the sausage meat mixture and run it along the middle of the pastry. Brush some of the beaten egg along one edge of the pastry and fold the other side over on top of this. Press the pastry around the sausage meat to make sure it is well sealed. Divide the roll into 4-6 pieces and trim the edges so that they are neat. Brush more of the egg on top of the rolls to give them a nice glossy finish and then press the edges with a fork to make sure they are completely sealed. Use a sharp scissors to cut a couple of slits in the top to allow the steam to escape while baking. Bake in the oven for approx 30 minutes until the pastry is puffed up and golden and cooked through. Allow to cool slightly on a wire rack before eating – if you can wait that long! Donna, this looks amazing! I love the use of apple here. Yum! 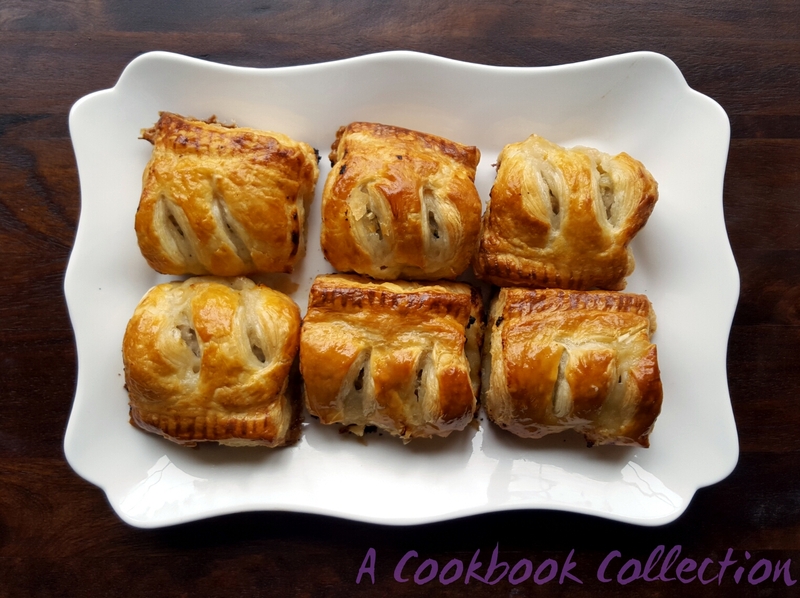 As someone who lives in Sweden and doesn’t get the chance to ever eat sausage rolls, these look amazing! Very nice indeed. The apple is a great idea. I made proper sausage rolls for the first time on Christmas Eve. I used Delia’s Christmas book for the recipe and they were lovely, so nice. Everyone loved them. So simple. Hi Lorraine, yes they do go down well. Nothing like a simple old style treat to make folk smile! I miss sausage rolls since we moved from Ireland to Spain. Thanks for the recipe, I will try them. I hope you like them, let me know how you get on! They look very good. We have a fave that uses roasted red peppers. They make a nice change. Gosh I want a (home made) sausage roll now! These look incredible. Puff pastry is so handy! But when I catered I could never make such items because they really needed to be cooked at the last minute. Thank you Mimi! It’s true they are best eaten straight from the oven. these are miss8’s fav food! Yours look so full of flavour. I thought I just had my lunch, but it appears I’m mistaken. The apple is genius! Thanks Tara it’s a nice addition alright.